Most men's shoes conform to the shape of the feet and have a roomy toe box with sufficient horizontal and vertical space and a low heel (usually about half an inch high). Soles made of hard materials such as leather or soft materials such as crepe can both be worn, but softer soles tend to be more comfortable. If you stand for extended periods of time, shoes with soft, pliable soles will protect your feet and help keep them comfortable. It is advisable to have three to five pairs of shoes for business hours - general oxfords and loafers are usually suitable. 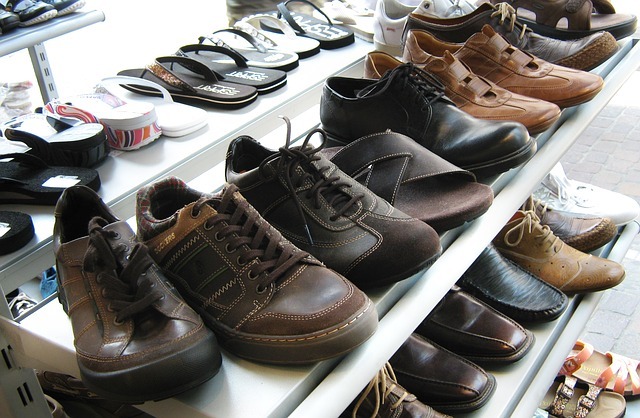 Cushioned-sole shoes give good support for those who spend most of their working days on their feet.